The story of Eric Liddell and Harold Abrahams competing in the 1924 Paris Olympic Games. In the years before the movie "Chariots of Fire" was released in 1981, the image of track and field and the Summer Olympics hadn't fared very well. 1968 saw an Olympics marked with protests, 1972 brought terrorism and tragedy, 1976 saw economic struggles and a half-finished stadium, and in a profound failure to comprehend the spirit of the Olympics, President Jimmy Carter enforced a boycott of the 1980 Moscow games to make a political statement. By 1981 the running boom was in full bloom. Thousands of runners logged their miles, trained hard, ran races and targeted marathons. Support for such aspirations had begun to appear in the form of books, like Jim Fixx's "The Complete Book of Running," a national best seller, along with training logs, magazines, and specialty running stores. Still the general public didn't quite understand the "jogging" craze and as a runner you may have still felt you were participating in something that was a bit out on the fringe. Into this environment came "Chariots of Fire," a valentine to runners everywhere. The movie brought us all back to a romantic era of sportsmanship and the pursuit of excellence, providing a noble and timeless validation for every runner's efforts. The movie was a hit, the non-running public was swept up along with rest of us in its vision of sport in its purest form. Suddenly the runner along the side of the road didn't seem so odd, you knew why he was there. Competitors now heard Vangelis' theme from the movie blaring from speakers during road races, everyone was hooked into the inspiration. If you haven't seen this Oscar winning movie, this DVD presents a long overdue opportunity. "Chariots" had been released on DVD in 1997, but it was a pan & scan, full screen version, a wide screen edition was only available in Europe. Finally everyone can see the movie the way it was originally shown, in it's 1.85:1 aspect ratio. It features remastered sound (Dolby Digital 5.1, French -Dolby Digital 2.0 Mono) and picture with subtitles in English, Spanish and French. The DVD menu is clearly laid out, very straightforward with all options on one screen. Since this is listed as a "Special Edition" I hoped that would mean glorious, pristine video quality. Sadly that is not case. The well-known opening scene of the runners in the surf has a flat, "VHS tape" quality to it and that flatness appears sporadically throughout the film. By and large the video image is good, but the disappointing opening sequence is a shock, especially as we have gotten used to the depth and detail of DVD images. Sound quality is good throughout the movie, but don't expect much of a surround effect from your system. The rear speakers are largely inactive throughout the movie, except for a thunderstorm sequence, and your powered sub-woofer will remain quiet until the song "He Remains an Englishman" and the foghorn blast from the steamship. The audio does come alive during the Olympic and competition scenes, delivering Vangelis' score in all its glory. Theatrical Trailer - This was fairly short and not very engaging, relying on quotes from reviews rather than dramatic excerpts from the movie itself. Screen Tests - These were elaborate screen tests, but they suffer from poor film quality. Ben Cross demonstrates that he had the character of Harold Abrahams nailed right from the start. Ian Charleson gives a much more aggressive portrayal of Eric Liddell in his screen test than he did in the film. 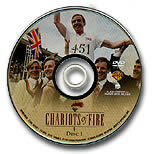 "Chariots of Fire - A Reunion" - This was filmed at producer David Puttnam's estate and includes the excellent reminiscences of Puttnam, director Hugh Hudson, director of photography David Watkin and actors Nicholas Farrell and Nigel Havers. Puttnam offers fascinating background on the spark that led to the making of the film, the research and early project development. Watkin provides interesting insights on the photographic decisions he made. "Wings on Their Heels: The Making of Chariots of Fire" - If one thing stands out from this very complete feature it is the sense of pride from everyone who took part in the making of this film. Producer David Puttnam recognizes this as the defining movie of his career and he emphasizes commitment as the spirit of the production. Director Hugh Hudson discusses this as his first feature film. He covers the difficulties in casting the two main characters and supplies insight into the actors' motivations. 16 minutes of deleted scenes - Seven scenes are presented that either reinforce points that were already well made in the film or others that take the focus off the central themes. One scene of playing cricket in a ballroom was cut from the US version because it was felt Americans wouldn't understand it. 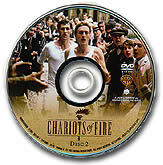 "Chariots of Fire" is a quiet, introspective, character-driven film that avoids sports movie clichés. It delivers a great story in an inspirational and beautifully crafted way. This DVD presentation isn't perfect, but it provides excellent background on the production and delivers the widescreen version we have been waiting for, it is a must own DVD for any runner. The DVD is available from most DVD retailers, including www.amazon.com.